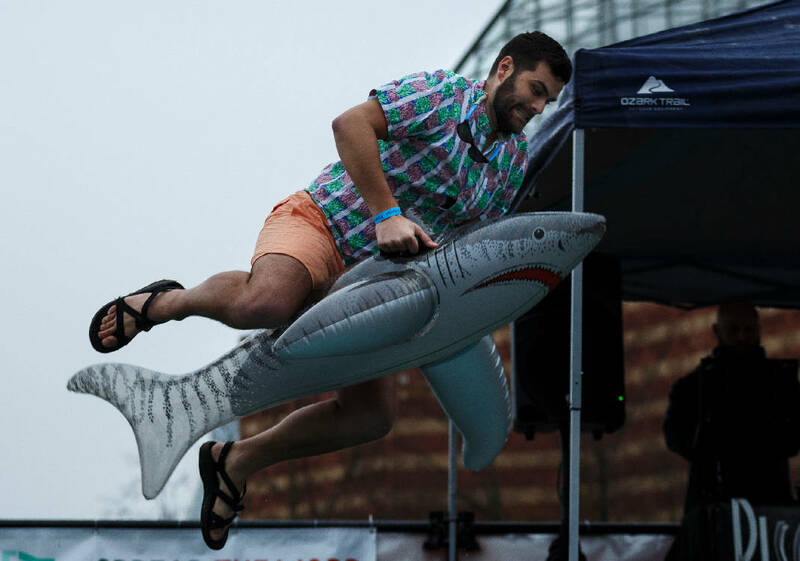 Bret Wade jumps into frigid water on his shark float at the 2018 Special Olympics Polar Plunge at The Green at Ross's Landing. This year's fundraiser is Saturday, Feb. 9. Are you tough enough to jump into an above-ground pool filled with freezing water? It's not insane; it's a cool way to support Special Olympics athletes. The annual Polar Plunge fundraiser for Special Olympics Tennessee will be held Saturday, Feb. 9, at The Green at Ross's Landing. Hundreds of folks will dress up in a variety of costumes and run, jump or belly flop into the frigid pool to raise money. To participate, register online at polarplungetn.com/chattanooga, then take pledges from friends and family who are willing to pay to see this endeavor. A minimum of $75 in donations is required for adults, $50 for children and students. In return, the plunger gets a long-sleeved T-shirt, complimentary lunch and bragging rights for a year. All participants must sign a waiver of release, and plungers under age 18 must have a parent or guardian's signature. Check-in begins at 10 a.m., followed by a costume contest at 11. The first plunger makes the leap at 11:30 a.m.